Referring to my first post about the Raspberry Pi, I am pleased to provide an update about my ongoing projects, with a special focus on a wireless headless operation. Headless means running it without a mouse, keyboard and monitor, via network connections. Wireless means using a WLAN connection with a WiFi dongle. A new Raspbian (the Raspberry Pi Foundation’s official supported operating system) version, based on Debian Jessie, was launched on November 21, 2015. Updates were released on February 9, February 26 and March 18, 2016. I upgraded my Raspberry Pi computers to the February 26 version (kernel 4.1.18+ on RPi 1 models; kernel 4.1.18-v7+ on RPi 2 and 3 models). I used the same procedure as last time : writing the downloaded Raspbian image with the Win32DiskImager tool on my Windows computer to 8GB and 16GB SDcards. The current version of this tool is 0.9.5, released on March 19, 2014. 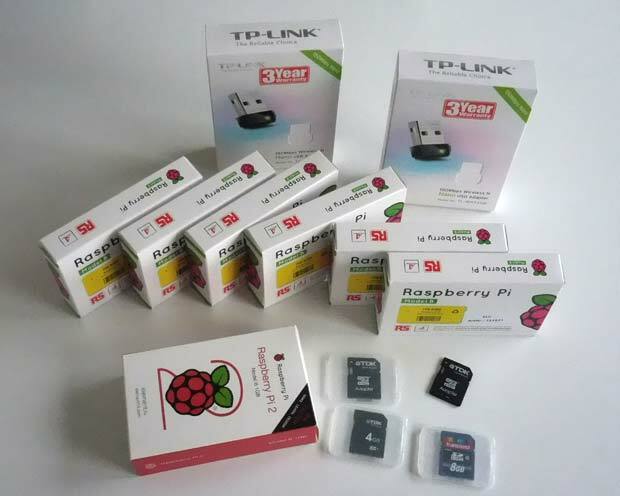 It was not possible to overwrite the old Raspbian image on my Raspberry Pi SDcards with the new one. Reformatting the used SDcards with the usual tools (diskpart, SDCard Formatter 4, …) was not successful. Windows sees only the 56 MB FAT32 partition, but not the much larger Linux partition. It was not possible to recover the lost space. After some trials and errors, I finally reformatted the SDcards in my Nikon camera. It worked like a charm. Writing the new Raspbian image to the new formatted SDcards was then no problem. After the first booting of the Raspberry Pi computer, the new desktop appears. The desktop contains only one icon : the Trash. The Raspberry logo is shown in the center. The menu is in the left upper corner, some icons are in the right upper corner. It’s possible to reconfigure the menu list. One new icon is the network configuration tool based on Roy Marples‘s dhcpcd and dhcpcd-ui packages. The configuration panel allows to expand the filesystem. After expanding and rebooting the system, the File Manager (PCManFM 1.2.3) shows a free space of 3,6 GB on my 8GB SDcard, compared to a free space of 98,1 MB before the expansion. The Raspbian Jessie version allows to set the locale to “lb” for Luxembourg in the localisation tab, and Luxembourg is also included as country in the timezone list. The french-swiss keyboard used in Luxembourg figures now, as expected, among the Switzerland keyboards. The computer was recognized by my Fritzbox router and the IP address 192.168.178.62 was assigned by the DHCP server. The files /usr/share/raspi-ui-overrides/applications/wolfram-mathematica.desktop and ../wolfram-language.desktop must be deleted to remove the related empty icons in the task bar. The default Raspbian terminal application is LXTerminal. The command dmesg (display message or driver message) prints the message buffer of the kernel. An error “bcm2708_fb soc.fb: Unknown ioctl 0x40187a22” is listed. An SSH client is a software program which uses the secure shell protocol to connect to a remote computer. SSH provides a secure channel over an unsecured network in a client-server architecture. There are numerous SSH clients available for the different operating systems. For Windows an often used SSH program is PuTTY. PuTTY is a free and open-source terminal emulator, serial console and network file transfer application which was written and is maintained primarily by Simon Tatham. 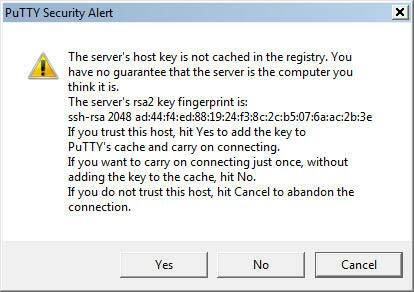 The following security alert is displayed by the PuTTY terminal at the first connection to a new server. The next figure shows the welcome message sent by the Raspberry Pi after a successful login. 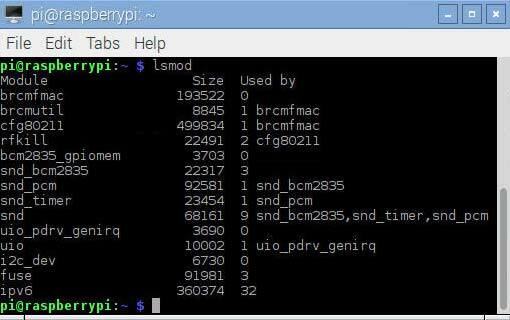 The default user name is pi and the default password is raspberry.These parameters can be changed in the Raspbian configuration. I use the WebSSH app for my iOS devices and the JuiceSSH app for my Android tablets. 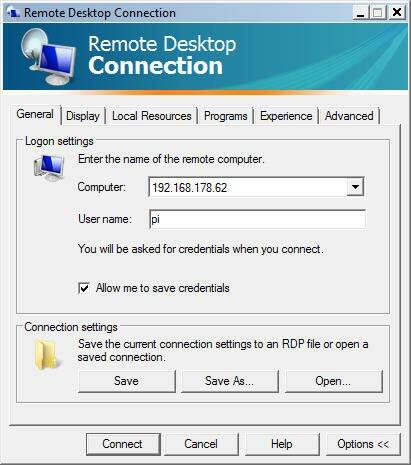 Remote Desktop Protocol (RDP) is a proprietary protocol developed by Microsoft, which provides a user with a graphical interface to connect to another computer over a network connection. The user employs RDP-client software for this purpose, while the other computer must run RDP-server software. RDP Clients exist not only for Windows and Windows Mobile, but also for OS X (version 8.0.24) , Linux, iOS (version 8.1.17) and Android. The problem with european keyboards explained in my former Raspberry Pi contribution persist and is even more difficult to solve on tablets. For this reason I discarded the RDP solution for my future projects. Tight-VNC is a cross-platform free and open-source remote desktop software application that uses and extends the remote framebuffer (RFB) protocol of Virtual Network Computing (VNC) to control another computer’s screen remotely. It was created by Constantin Kaplinsky. Most tutorials about remote desktops refer to the Tight-VNC-Server as favorite solution. One disadvantage of this application is that it uses only virtual desktops, which is not optimal for a headless operation of a computer. Therefore I discarded the Tight-VNC-Server for my projects, but i use the Tight-VNC-Client on Windows as viewer to work with an X11-VNC-Server. 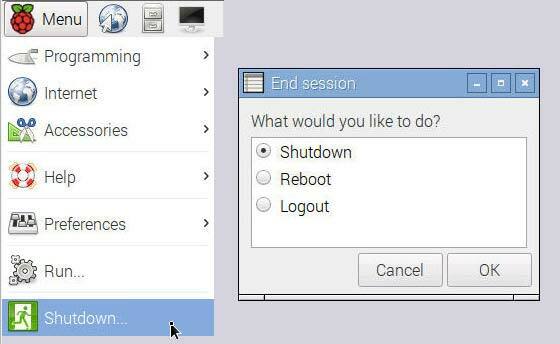 X11-VNC allows remote access from a remote client to a computer hosting an X Window (X11) session and the x11vnc server software, continuously polling the X server’s frame buffer for changes. X11-VNC does not create an extra display for remote control. Instead, it uses the existing X11-display shown on the monitor in real time. The VNC-server takes the display size from the resolution of the connected HDMI monitor. In case of headless operation, the display size on the VNC viewer is very small. To adapt the display size to the iPad (my preferred VNC viewer), I uncommented and modified the following lines in the configuration file /boot/config.txt. For security reasons I configured the VNC-server to be only accessible in the local network. The Raspberry Pi 3 model has an onboard WiFi chip. The command lsusb shows the ID of the dongles, here for the official Raspberry WiFi adapter. 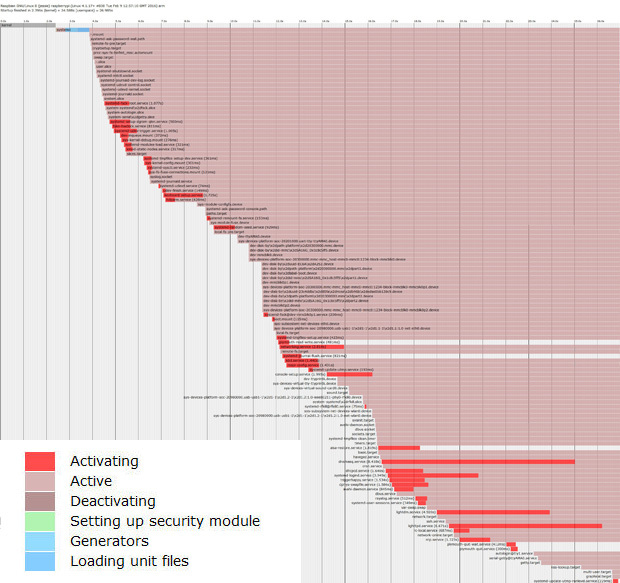 The command lsmod shows which loadable kernel modules are currently loaded. In the case of a RPi 2 or 3 device, the module is /4.1.18-V7+/. The command iw list shows the features of the installed WiFi dongle. Among the listed features, the supported interface modes are the most important. The support of AP means that the WiFi dongle can be used as WLAN access point. The command dmesg (display message or driver message) prints the message buffer of the kernel. 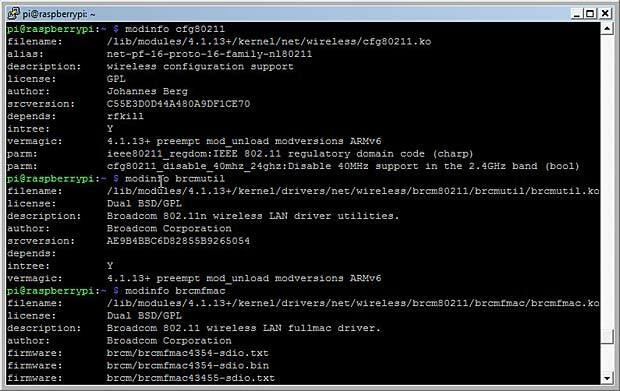 The result shows an issue with the brcmfmac driver for the official Raspberry WiFi dongle. Nevertheless the official WiFi dongle seems to work as expected. The WiFi dongles Raspberry, Racksoy and D-Link DWA-131 work out of the box in my Raspberry Pi. 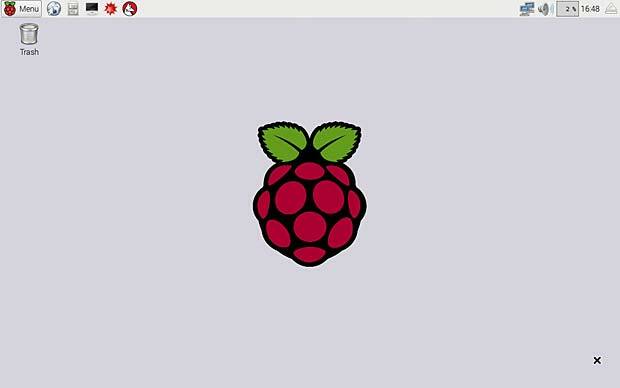 The following figure shows the Raspian Desktop with the activated Wifi icon. The two pasted message panels show the informations displayed when the mouse hovers the WiFi icon : the first case with additional wired Ethernet connection, the second case without Ethernet connection. modprobe is a Linux program used to add a loadable kernel module to the Linux kernel or to remove a module from the kernel. After rebooting the dongle works as expected. For practical reasons I linked copies of the files 8188eu.ko and 8188eu.conf in the present post. 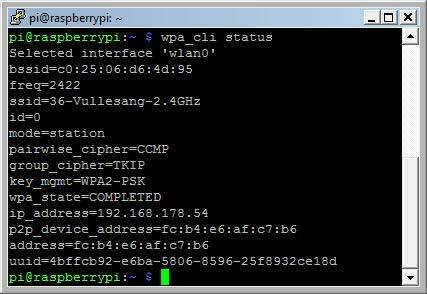 To connect the Raspberry to a remote WLAN Access Point, a software must run to provide WPA key negotiation with a WPA Authenticator and EAP authentication with an Authentication Server. 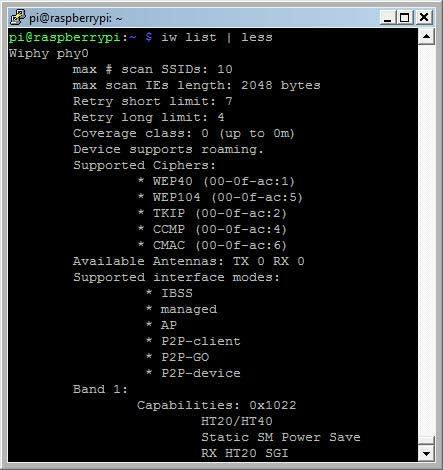 The most common program for these tasks is wpa_supplicant, a free IEEE 802.11i software implementation developed by Jouni Malinen. In computer networking, a supplicant is an entity at one end of a point-to-point LAN segment that seeks to be authenticated by an authenticator attached to the other end of that link. 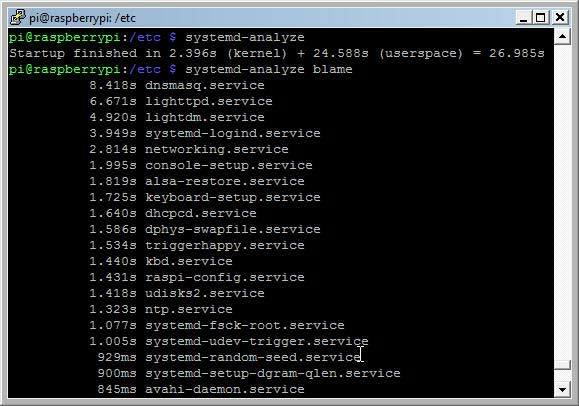 wpa_supplicant is a daemon and only one instance of it may run on a machine, all other modifications of security settings are made with the text-based frontend application wpa_cli. wpa_cli is used to query current status, change configuration, trigger events, and request interactive user input. wpa_supplicant is pre-installed in Raspbian Jessie. To use a WiFi dongle in AP mode on Rasperry, you need hostapd or a similar application. wpa_supplicant allows basic AP configuration, but does not include support for most of the AP parameters. Comparing the hostapd.conf with the wpa_supplicant.conf example provides a picture of the difference. 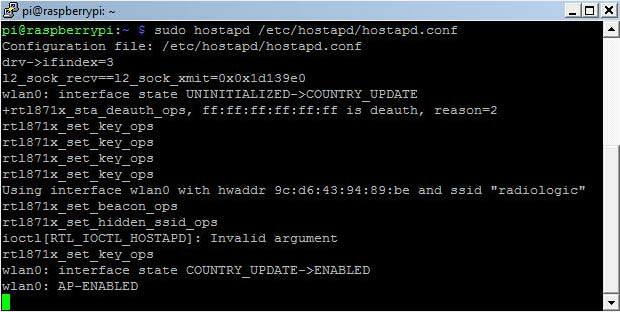 The version check after the successful installation shows version number 2.3.
hostapd is developed and maintained by the author of wpa_supplicant, Jouni Malinen from Finland. hw_mode : wireless mode : A, B and G are available; these are the last characters of the IEEE 802.11 standard. The most common is G (2,4 GHz). The complete list of hostapd parameters is available at the website of the developer. The Raspberry WiFi dongle works out of the box with the default hostapd driver nl80211. The Racksoy WiFi dongle works with the autoselected driver rt2800. The two other WiFi dongles D-Link DWA-131 and TP-Link TL-WN725N are not supported by the standard hostapd module with the included drivers. Both dongles use Realtek chipsets needing a specific driver, named rtl871xdrv. 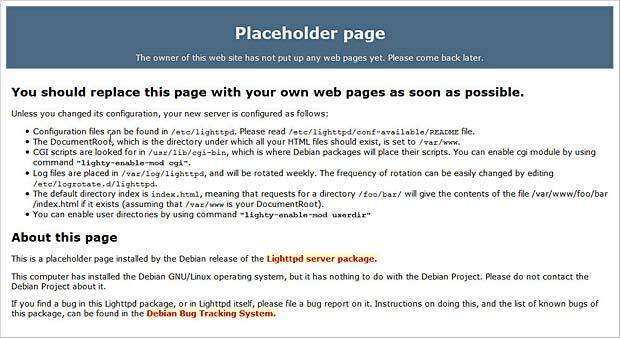 There are numerous posts and tutorials available at the web dealing with this problem, but only few provide correct and relevant solutions related to the current Raspbian Jessie version. The last step is to change the driver name as rtl871xdrv in the hostapd.conf file and to reboot the Raspberry Pi with a Realtek WiFi dongle. After terminating wpa_cli and starting hostapd, we get the confirmation that the Realtek dongles are now working. Adding the optional parameter -dd (after hostapd) in the above command provides a detailed report about the process, which can be very helpful in case of problems. After a few moments the WiFi-panel in the Raspian desktop shows that the wlan0 interface is ssociated with the SSID “radiologic”. The interface is configured as AdHoc network with an self-assigned IP address in the range 169.254.0.0/16. I used an iPad as WLAN client to test the WLAN-Host. The SSID “radiologic” is displayed in the list of available WiFi networks as secured WLAN. After entering the defined password “123456789”, the connection is established. 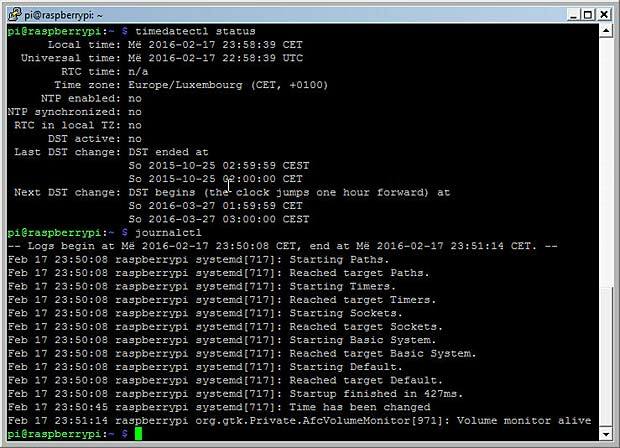 The next figure shows the related messages displayed in the Raspbian terminal window. hostapd can be terminated by pressing simultaneously the keys “Ctrl” and “c” . We need to insert the same parameter in the init file /etc/init.d/hostapd. Hostapd needs random data to encrypt the WLAN. In computing, the randomness of data is called entropy. When the entropy is too low, “Add randomness” messages are displayed. When the returned value is less than 1.000, the entropy is unsufficient for secure cryptographic processes, which is often the case in small systems like the Raspberry Pi. Fortunately there is a solution : HArdware Volatile Entropy Gathering and Expansion (HAVEGE). Another critical point related to hostapd is the power-save feature of most WiFi dongles. While this is a strong advantage when the WiFi dongle is in infrastructure mode (outbound) where the device is reactivated by the user, this is a great risk in AP mode when the computer works headless. In power-save mode, the WiFi dongle is no longer accessible by an external client and the only solution is to reboot the computer by unplugging and re-plugging the power supply. We can check the status of power management with iwconfig. Another possibility is to create configurations files in the directory /etc/modprobe.d/. Until now, the WiFi adapter has an auto-assigned IP address and the clients don’t receive an IP address when connecting to the WLAN, which is not a workable solution. We need a static IP address for wlan0 and a DHCP-server to attribute IP addresses to the WLAN clients. Many tutorials about Raspberry Pi deal with static IP addresses to simplify the access to the RPI when the routing is managed by a DHCP-server. 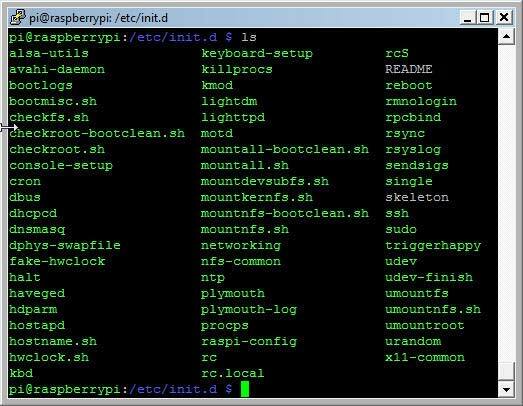 Most of them refer to the legacy ifupdown configuration file /etc/network/interfaces, which is obsolete with Raspbian Jessie using the DHCP-client dhcpcd developed by Roy Marples. The network configuration should be done in the file /etc/dhcpcd.conf. If a static IP address is required for the eth0 interface, a more simple way is to set it in the router of the local network. In my specific case this is a Fritzbox 7390. 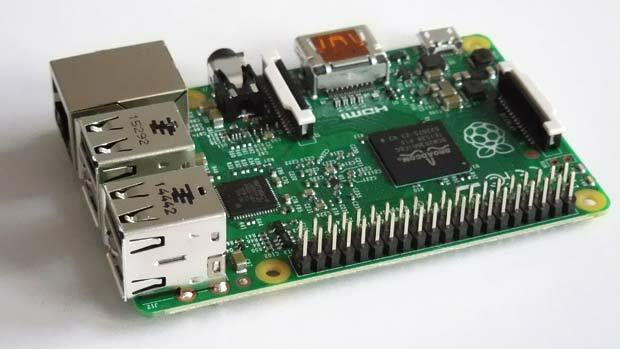 The best way however is to use the hostname of the Raspberry Pi to access it in the local network. The default hostname is raspberrypi. 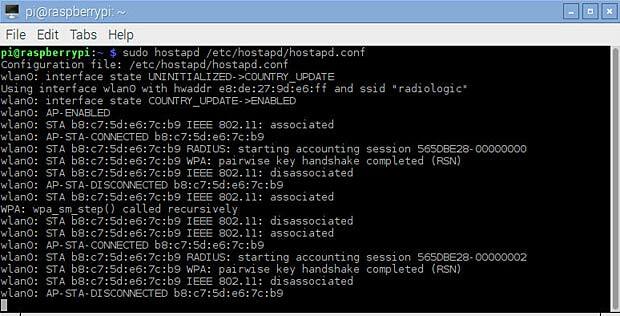 The hostname can be easily changed in the raspi configuration. The hostname is saved in the files /etc/hosts and /etc/hostnames. The lo interface (loopback) serves communication with localhost and is started automatically at boot. The IP address for the eth0 interface is requested by dhcpcd and provided by the LAN-router. The configuration for the wlan0 interface is provided by the /etc/wpa_supplicant/wpa_supplicant.conf file. 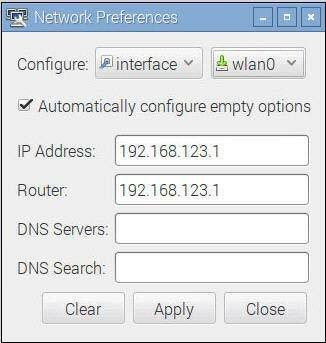 A static IP address (192.168.123.1) can be attributed to wlan0 by means of the WiFi Network Panel opened by right clicking the WiFi icon in the task bar. The data inserted in the WiFi Networks Settings are saved in the /etc/dhcpcd.conf file as shown above. One piece of the puzzle is still missing : a Dynamic Host Configuration Protocol (DHCP) Server to provide IP addresses to the WLAN clients. 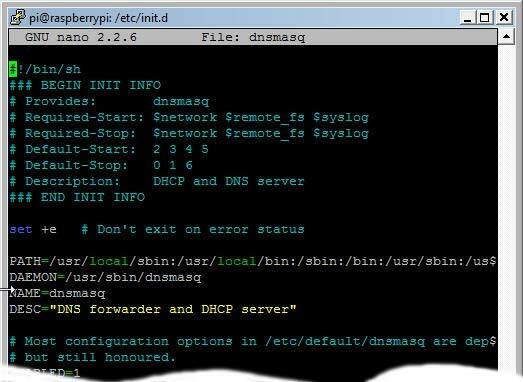 There are several dhcp-server packages available for Raspbian. I selected dnsmasq, a very useful module to set up a complete WLAN router. dnsmasq is a Domain Name System (DNS) forwarder and a DHCP-server for small computer networks, which are easily configurable, with low usage of system resources. The DHCP-server is restricted to the wlan0 interface, the eth0 interface is excluded. The range of IP addresses to attribute to the WLAN clients is bounded by 2 and 99 in the sub-network 192.168.123.0. The lease time is 12 hours. 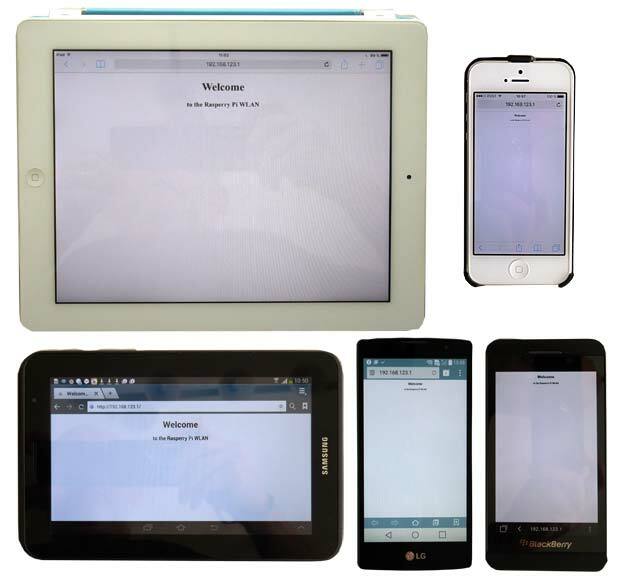 The following photo shows the result on various mobile devices accessing the radiologic WLAN. Currently the clients can only access the embedded web server. If we want that the WLAN clients have access to the global Internet or to other services, we need to add more network configuration parameters or specific applications. This will be a topic of further contributions. As a last step we check that all programs are running without errors and that the performance of the system is correct. First we need to understand the boot process. When we enable a service to auto-start, we are adding it to a runlevel. Default Debian installation does not make any difference between runlevels 2-5. Number 2 is the default runlevel at start. In a normal boot the levels progress up to 5. Runlevels S and 1 are used for maintenance. Runlevels can be edited manually by editing control scripts in /etc/init.d and symbolic links in /etc/rc0.d … /etc/rc6.d. The runlevel can also be changed at runtime with the command telinit [runlevel 2-5]. The current runlevel is indicated with the command runlevel. Looking at the list of the services included in the /etc/init.d/ folder, we discover among others the installed programs dnsmasq, dhcpcd, haveged, hostapd and lighttpd. We see that the virtual boot facilities $network, $remote_fs and $syslog must be started or stopped before the dnsmasq service. Creating init scripts manually is an error-prone task. 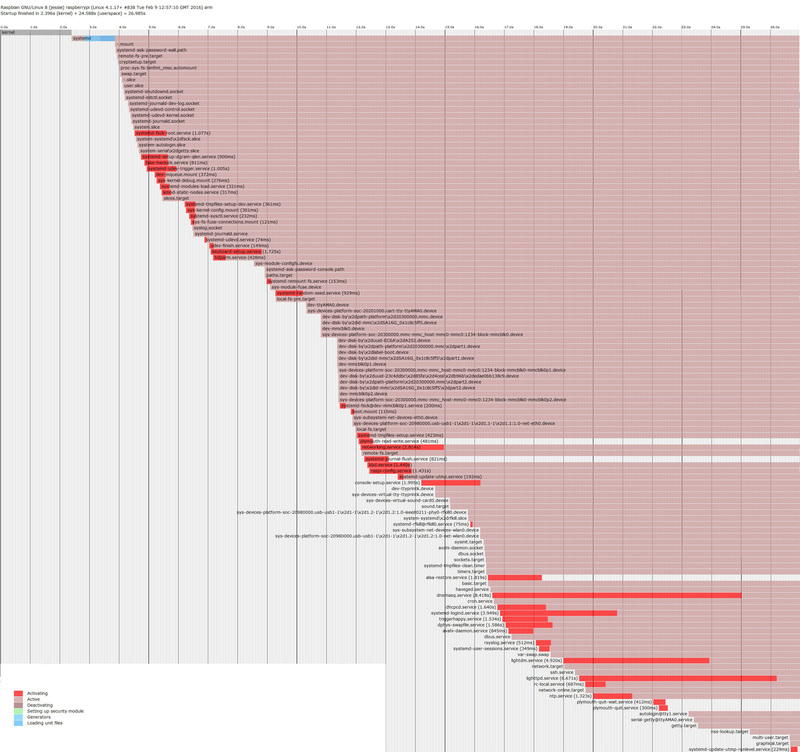 For this reason the legacy System V (SysV) init program has now been replaced by new init systems. Raspbian Jessie is using systemd as service manager. We have already seen the related tool systemctl to start, stop, enable and disable programs. 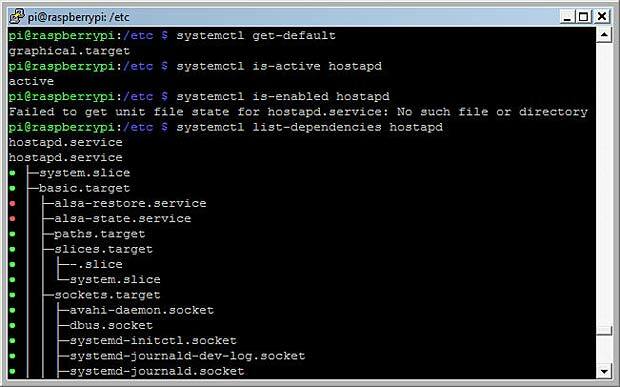 In systemd, the targets of most actions are units, which are resources that systemd knows how to manage. Units are categorized by the type of resource they represent and they are defined with unit files. The systemd files are located in the directories /lib/systemd/system/ and /etc/systemd/system/. will print the boot time respectively print the list of the most time-consuming services in decreasing order. creates an xml svg file which can be rendered in a browser. It displays in a graphical way when all the services start. journald provides various filters using time constraints. Logs can be viewed in UTC or local time at will. The following journald commands deal with time and date. It’s also important to make at regular times a backup of the Raspberry Pi SDcard. Backups are possible on Windows 7 systems (or later) with the Win32DiskImager tool. First an image of the source card is saved to a file on the Windows PC. In an second step this image is copied to a backup SDcard. Backup’s can also be done with the Raspberry Pi itself by using an SDcard reader with USB interface. Cloning a SDcard is the same procedure as doing a backup, but the goal is different. Cloning allows to distribute a complete mirror of a working RPi system with operating system, applications and data. This way it’s easy to copy and multiply an existing solution. Sometimes a cloned image file can’t be copied to an SDcard with the same capacity, because SDcards can vary a little bit in size. There are several tutorials on the net how to solve this problem by shrinking the image file, for example one by Andrew Aokley, another one on the Wonky Gibbon Ramblings Blog. 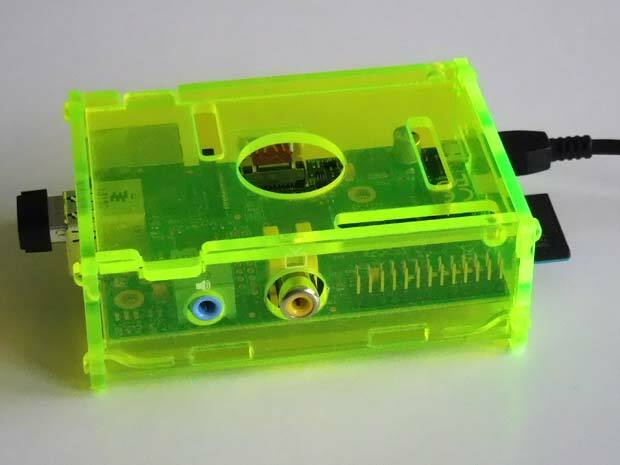 This entry was posted in Programming and tagged Raspberry, Raspbian by Marco Barnig. Bookmark the permalink.